2006: Anil Rohatgi builds a 915 MHz spread spectrum multi-tag system that demonstrates polarization and space diversity in a real backscatter communications link. This 2006 experiment was a landmark for many reasons. It was the group’s first foray into coding theory for backscatter systems. It also garnered an invite to the 2008 IEEE RFID conference in Las Vegas … a relationship that has turned surprisingly long-term. 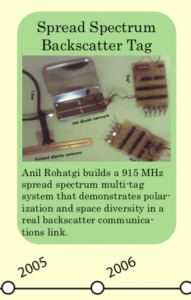 Anil Rohatgi used Albert Lu’s downconversion hardware at 915 MHz to demonstrate a two-tag system that could be read simultaneously using unique spreading codes assigned to the two tag emulators. Each tag could be assigned a unique m-sequence, dialed in manually with toggle switches. Crude by today’s standards, the experiments were still the first demonstration of simultaneous reading of tags as with spread spectrum. Additionally, they were used to illustrate a peculiar form of polarization diversity that exists for the backscatter link. Fun fact: In this era — before the advent of 3D printing — the group always sought simple, metal project boxes to encapsulate and shield their custom electronics. In this era, nothing beat the utility of hinged Altoids cans … you can even see one in the picture above. Although this was not always photogenic for the advising professor to present at conferences, for a time the students of the GTPG had the freshest breath on campus.